Waste Professionals Share Their Wish Lists – What’s Yours? When new technology begins to transform a traditional business, there is resistance, there is sometimes fear, and all too often, there is a perception that in the end, there will be winners and losers. But that’s not the case in waste. Whether you’re a waste maker or waste taker, a municipal regulator or waste consultant, this is one of those rare circumstances where everyone is pretty much on the same page when it comes to modernizing and improving operations. A round of interviews recently conducted in the 4th largest city in North America reveals just that. Waste management professionals from around the industry are clamoring for the insight and control over their operations that other tech-savvy businesses have enjoyed for years. Here’s how they responded to this telling question; essentially all had the same answer. 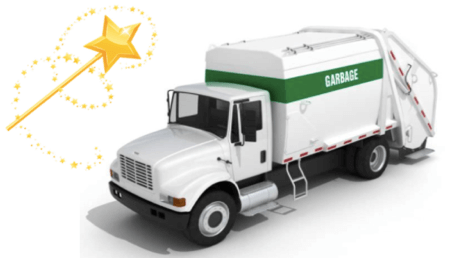 Q: If you had a magic wand that would enable you to do anything you can’t do in your waste operations today, what would it be? We recommend tying waste hauling to bin fullness for operational efficiency. Without information on compaction rates on at least a daily basis, it makes it difficult to schedule hauling as needed. Typically, a pickup is scheduled when a bin fullness hits 70 percent, and the waste hauler requires 48 hours to arrange pickup. Having access to information in real-time is critical to reducing unnecessary pickups – which in turn, cuts operating expenses and carbon emissions. Eighty percent of the administration of waste operations is spent on tedious, manual tasks like data entry, tracking and recording bin weights, composing one-off emails. New solutions are needed that bridge the gap between the physical world of bins and compactors to the world of digitized information. Sensors that measure and capture physical bin data like fullness, weight and time of empty, and consolidate that information into accurate, operational reports, will modernize the waste industry. It’s like operating in the dark when you don’t have a fullness gauge on waste bins. We estimate that between 30-40 percent of our pickups are premature, paying to empty compactors that aren’t yet full. There is no way to properly schedule waste hauling without the benefit of fullness data. Discrepancies between us and our waste hauler is a common occurrence, with no way to verify operations with a single system of record. A GPS system in the hauling vehicle allows only partial insight, and sending someone to spot check a pickup property is time-consuming and costly. We spend 3-4 hours a week confirming haul data. We’re looking for transparency in hauling operations, including access to real-time reporting evidence of full contractual compliance so we can work together with our hauling service with confidence. We require that contractual evidence to comply with corporate environmental initiatives. This year’s budget impacts our municipality’s waste management operations. The result: we must reduce our expenses significantly. Accurate reporting on hauling frequency and routes, bin fullness data, and recycling efforts, will help improve efficiencies. We recognize there is a lot of room for improvement and estimate that we can cut our trucking costs by 70 percent based on data from a sister city in our region. Our biggest challenge is our inability to produce automatic communications with our hauling service. Because of the size and seasonality of our operation, compactor fullness and weight must be constantly monitored and vary so widely that fixed pickup schedules can’t accommodate them. In an ideal world, we would set fullness and weight thresholds that when met would automatically generate a pickup request. As a hospital, we are considered large waste makers and are subject to environmental regulations and an annual waste audit. We are held accountable for the entire lifecycle of our refuse, from haulage to diversion to recycling programs. It’s imperative that we have access to detailed reporting in order to comply with the mandates set out by our Environmental Services team – down to a daily real-time report of the status of each compactor. The waste business is changing and we need to find ways to stay competitive. Providing access to compactor data on fullness and weight, and verification of pickup and landfill dumps would help build much-needed transparency into our operations. Full accountability on our part helps our customers prove compliance with green initiatives and prepare waste audits. We want to be considered an indispensable partner in those processes. Our pickups are tied to a weight metric so it’s vital that we have this information in order to schedule and forecast hauling requirements. Capturing bin weights by haul and consolidating that data costs us time and money. We spend several hours each month manually tracking weights by invoice. A system that tallies pickups calculates total weight and tracks weight in real-time would enable us to control costs by replacing fixed-schedule hauling with an on-demand process.That’s a much more efficient way to do business. The US National Environmental Agency (NEA) has updated mandatory waste audit reporting requirements which affect, but are not limited to, commercial rentable spaces greater than 4,600 square meters (50,000 square feet) and hotels with more than 200 rooms. Beginning September 1, 2019, these businesses must submit a daily record of their general waste.The NEA recommends bulk bins and dust drums are fitted with weight sensors so that refuse weight can be recorded for every hauling trip to comply with new regulations. Many large enterprises will need to adopt new technologies that can accurately gather remote data and produce the audit reports necessary for regulatory compliance. Newsmart sensor technology that delivers accurate, real-time data and reporting seems to fulfill the wish list of all key operators in the waste industry. Waste makers get on-demand insight into status and processes. Waste haulers gain the competitive advantage by offering the full operational transparency their clients require. Waste consultants achieve accountability in waste processes. And waste regulators will experience smoother audits with easy-to-produce compliant reports.